Czech patriots in May 1945 combined various headgears and parts of uniforms, which makes looking for useful figures easier. For railway workers and Prague tramway personal heads in kepi from Preiser Uniformed policemen set (Art. Nr. 72513) can be used. For useful "Adrian" helmet we have to wait until Pegasus set of French Army 1940 will be released. 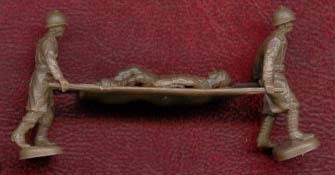 There is a lot of figures in heads with German WWII helmet and WWI Mark 1918 could be used as well. Chechoslovak pre-war helmet vz.34 should be made as a resin-set. The first figure can represent Czech policeman, gendarme or cavalry officer as well. It is form Esci 205 - French Soldiers set. A lot of 1945 volunteers were Chechoslovak WWI legionaries. Italian legionary in distinctive "Alpini" headgear is from Esci 211 - Italian Mountain Troops set and Russian legionary in "Vladivostock" uniform is surprisingly from IMEX 532 - North Korean KPA set. A member of physical training organisation "Sokol" is from Esci 232 - Colonial India British Infantry set. It needs only a falcon feather add to its headgear. Heads in kepi contains Preiser 72513 - Uniformed policemen set. They can be used for Czechoslovak railway workers, postmen and Prague tramway personel. Boys-scout headgear can be taken from Airfix 01729 - WWI American Infantry set. Legs in Boys-Scout short trouser could be taken from British 8th Army soldiers. Czech Militia in Prague - Podbaba captured German Marine suits. This feature can be found in Revell 02525 - WWII German Navy set. I was looking forward Pegasus 7228 - Germans in Berlin 1945 set a lot for Czech 1945 uprising conversion potential. 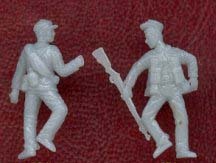 But I have found this three figures usable as Czech Militia volunteers only in it. 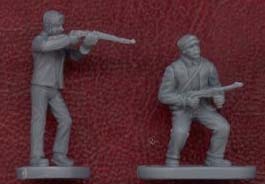 Hopefuly some Vlassov's soldiers can be taken from this set (see below) and rest of the set can be used for Czech Militia counterplayers of the Volkssturm and the Hitlerjugend. Partisans from Caesar H006 - WWII Underground Resisters (Partisans) set should be handed carefuly. Just the first figure in the first row needs replacing of the Molotow Coctail with hand grenade, used in Czech Lands. Man with detonator in the second row could be used only for fights outside Prague and probably Norwegian with STEN-Gun could represent Czech Militia volunteer only from areas armed from England, typically Moravia. I have omitted a Gestapo-member with gun and I feel that gangster (third in the first row) a little-bit problematic as well. 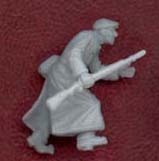 Hit Czechoslovak cavalryman is from Airfix 01729 - WWI American Infantry set. A man with MP-40 is from Caesar H006 - WWII Underground Resisters (Partisans) set and stretcher party is from Esci 205 - French Soldiers set. These people could represent members of the Luftschutz. 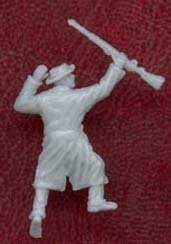 The last figure is from IMEX 531 - Chinese People's Liberation Army set. 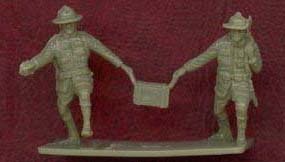 First two figures are from IMEX 531 - Chinese People's Liberation Army set. They are followed by former WWI American from Airfix 01729 - WWI American Infantry set, former North Korean from IMEX 532 - North Korean KPA set and a former Berliner from Pegasus 7228 - Germans in Berlin 1945 set. From the left: Caesar H006 - WWII Underground Resisters (Partisans), IMEX 532 - North Korean KPA and IMEX 531 - Chinese People's Liberation Army. 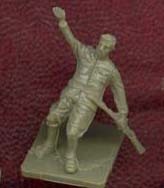 The last two figures features great colour conversion potential for Luftschutz, Czechoslovak Army, railway or tramway workers' uniforms or for typical blue workers' clothing. Among others figures in German uniform I feel these as best representing Vlassov's soldiers in Prague. Officer at left wears typical headgear for ROA officers. 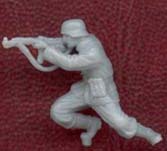 It is from Pegasus 7202 - Waffen SS - Set 2. Despatch rider with sights on his helmet is from Revell 02513 - Afrikakorps set and three figures in battle poses are from Pegasus 7228 - Germans in Berlin 1945 set. Pictures are from Plastic Soldier Review.